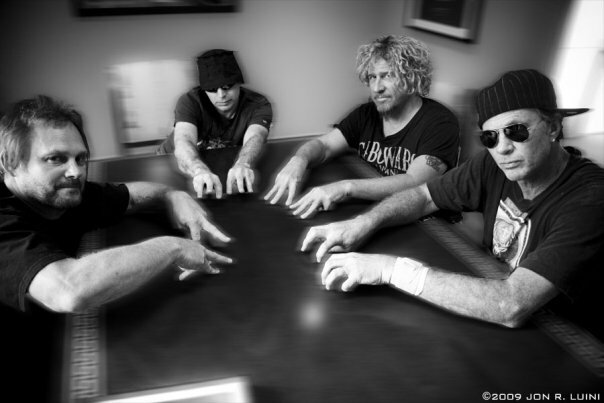 Chickenfoot have posted an update on the band’s current status and possible future plans. Although they haven't played together, the band members – Sammy Hagar, Joe Satriani, Michael Anthony and Chad Smith – have been seeing each other here and there over recent months. Sammy stopped in at Skywalker Studios during Joe's recording of his new album, “Unstoppable Momentum.” Chad and Mike recently joined Sammy in the studio to play on some tracks for him on his upcoming solo album. Anthony recently performed with Hagar at his annual Cinco De Mayo show in Tahoe. Ahead this year, Satriani and Hagar each have solo tours on the schedule, but Chickenfoot say they expect to regroup to make some new music in 2014. The band’s last effort was “Chickenfoot III,” which was released in the fall of 2011. Smith’s commitments to the Red Hot Chili Peppers prevented him from joining Chickenfoot for live dates in support of the project, so the group brought in Kenny Aronoff to handle drum duties in his absence.